Ewald-Heinrich von Kleist-Schmenzin was born in July of 1922. More than two decades later at the age of 22, he was an infantry officer of the German army. Ironic, since both Ewald-Heinrich and his father hated everything there was about Nazi ideology (the elder von Kleist-Schmenzin had even tried to arouse support from western countries for a coup against Hitler). 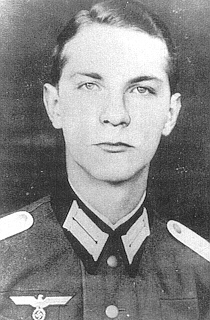 In January of 1944, Ewald-Heinrich was approached by Claus von Stauffenberg for a bold plan: to assassinate Adolf Hitler with a suicide bombing. Von Kleist-Schmenzin volunteered to take the place of a wounded officer. However the attempt had to be cancelled because Hitler kept postponing the event which would have him placed near the bomb. Then came the following summer, and von Kleist-Schmenzin became involved with the now-famous July 20th Plot: the plan to kill Hitler - again by suicide bombing - while "Der Fuhrer" was at his Wolf's Lair retreat in the mountains of Poland. This time it was von Stauffenberg who placed the explosive. It went off: destroying the conference room but leaving Hitler himself virtually unscathed (the dictator later took it as a sign of divine intervention). In the days that followed von Stauffenberg and most of his fellow conspirators were arrested and executed (some being hung with piano wire, with von Stauffenberg dying by firing squad). Von Kleist-Schmenzin's father was one of those killed but almost miraculously, Ewald-Heinrich survived. He wound up arrested and questioned, sent to a prison camp, then released and put back into army service. All the while Ewald-Heinrich was helping the German resistance movement and doing a darned good job covering his tracks (obviously). This past week, on March 8th 2013, Ewald-Heinrich von Kleist-Schmenzin - Nazi army officer and the last surviving conspirator of the plot to kill Hitler - passed away. He was 90 years old. Ewald-Heinrich, this blogger salutes you and your courage. May you have a joyful reunion with both your beloved father and your Father in Heaven.